Art show: Drizzle 12, a mixed-media work by artist Lam Huynh Linh, is on display at the Abstract Art + exhibition at HCM City Fine Arts University. HCM CITY (VNS) — A collection of abstract oil paintings by three HCM City-based painters at the HCM City Fine Arts Museum feature different perspectives on life. Lam Huynh Linh, Mac Hoang Thuong and Vo Duy Don's works in the Abstract Art + exhibition use an eclectic range of materials and topics. 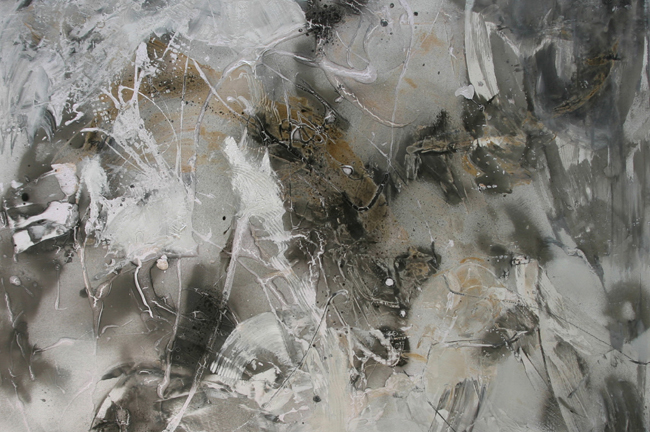 Linh, 45, presents mixed materials on canvas depicting the beauty of nature, using black, brown and grey colours in Drizzle 12 and Sedimentary 1. Linh, a graduate of the city's Fine Arts University, is the seventh son of veteran artist Nguyen Lam, who has more than 50 years of experience working with lacquer restoration. Linh's colleague, Thuong, 39, also uses mixed materials and dark colours for his works that reflect images of and scent of crops on fields. Thuong, who graduated in lacquer from HCM City's Fine Arts University, chose pencil drawings and oil paintings to exhibit. The university lecturer hosted his first solo exhibition of drawings in pencil in 2012. Don, 34, uses bright colours like blue and pink to reflect the breath of life in his oil paintings.